Under Texas law employers are allowed to obtain worker's compensation insurance to avoid being sued by their employees for most work injuries. If an employer has worker's compensation insurance, then an injured employee who survives cannot sue the employer for injuries sustained while at work. The employee can only obtain help through the worker's compensation system for injuries sustained. This is frustrating to many injured workers, because they feel that they cannot obtain just compensation. However, there is one primary exception to this rule. If an employee is killed while working, then certain of the employee's family members can sue the employer for gross negligence. Gross negligence generally is when an employer acts or fails to act with a conscious disregard for the safety of its employees. If a Texas employer does not have worker's compensation insurance, then the employer is called a "non-subscriber” i.e. the employer does not subscribe to the worker's compensation system. Such an employer can usually be sued in court for damages to an injured employee. The exception would be when there is a valid arbitration agreement requiring an employee to arbitrate his or her claims related to the injuries sustained at work. Arbitration is a proceeding that occurs outside the court system. When a non-subscriber employer is sued for a workplace injury in Texas, or pursued in arbitration, the employer waives the primary defenses usually available to most defendants. The primary defense which is waived is known as "comparative fault." Some people refer to this as contributory negligence. Comparative fault lets a judge, arbitrator, or jury determine the percentage of fault of all people who could be responsible for a person's injuries. In a non-subscriber work injury case, if an employer is only 1 percent at fault, the employer is liable for 100 percent of an injured employee's damages. If employers chose not to subscribe to worker’s compensation insurance, they assume the risk of injuries to their employees. In Texas, when employers are covered by worker's compensation insurance and an employee is injured at work and if someone other than the employer is totally or partially responsible for the injuries, the employee can sue the other person or company. These are called "third-party claims." Examples of the third party claims are (1) If the injury is caused at a construction site and the injury is caused by an employee of another company the employee can bring suit against the other company or its employee; (2) A machine is defective, and an employee is injured as a result, then the machine manufacturer can be sued; and (3) if an employee is injured in an auto accident while driving a company truck, the employee can sue the other driver if the other driver is at fault, or a dangerous property site if an employee or another company is at fault. The worker's compensation insurance carrier would have a lien against any settlement proceed for any amounts it paid through worker's compensation insurance with certain exceptions. If you are injured in your work place in the State of Texas and your employee does not subscribe to Workers Compensation Insurance, The Law Office of Jimmy C. Bailey and Associates P.C. represent employees regarding non-subscriber claims and third-party claims and workers who are injured and the employer is a non-subscriber of worker’s compensation insurance. 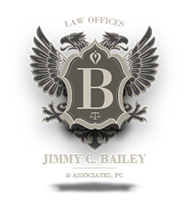 Jimmy C. Bailey & Associates, P.C., in Dallas, Texas, we have 40 years experience in helping Texas workers seek financial compensation for workplace injuries. We can help represent you for your lost wages, unpaid medical bills, ongoing treatments and other damages such as physical pain and suffering, mental anguish and physical impairment.